This "Florence Cathedral" tapestry shows a large cathedral dome in the beautiful city of Florence. Florence is the capital of the Italian region of Tuscany. The city has a large population and is considered one of the most beautiful in the world. A centre of trade and finance in medieval times, it was also the birthplace of the Italian Renaissance art era. Here we see the best-known icon of Florence, the domed Santa Maria del Fiore, or Basilica of Saint Mary of the Flower, a domed cathedral, the dome of which was built by Filippo Brunelleschi in 1436. The facade, bell tower and dome as well as the portal of the cathedral is an architectural marvel. Here we see a bird's eye view of the cathedral with the hills of Tuscany in the background. 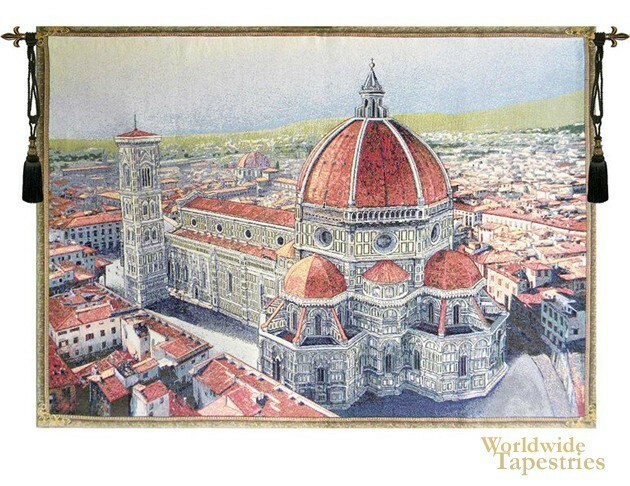 This cityscape tapestry "Florence Cathedral" is backed with a lining and has a tunnel for ease of hanging. Note: tapestry rod and tassels, where pictured, are purchased separately.